The free web hosting service GeoCities was founded by Beverly Hills Internet in July 1995, which exactly corresponds with the moment that the web left academia and started to become accessible to everyone. 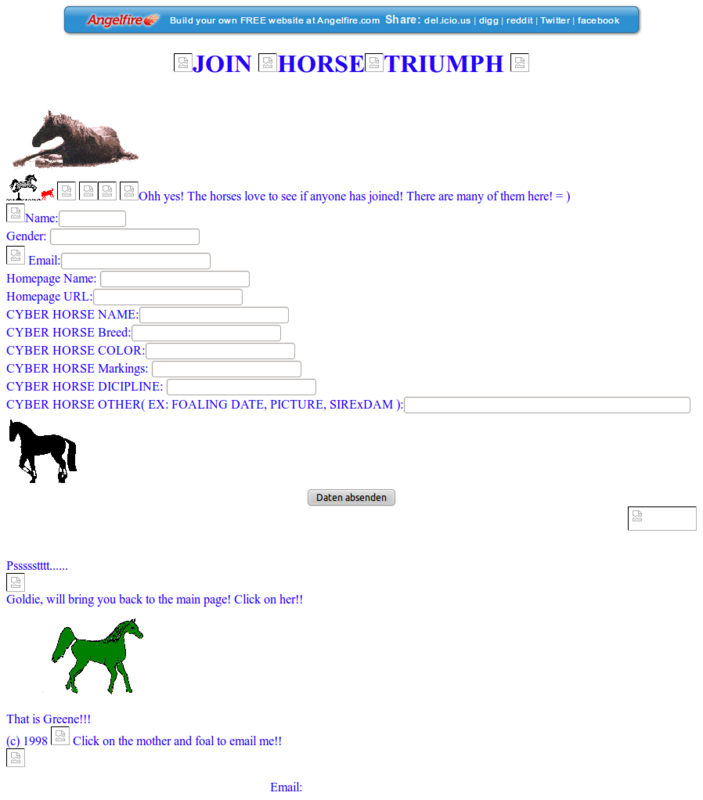 Users began learning Hyper Text Markup Language, and welcomed each other onto their “home pages” — the first personal websites. Geocities soon emerged as one of the most popular and inhabited places on the WWW and remained so until the late 90s. Yahoo! purchased it in January 1999, at the peak of dot.com fever. In the new millennium, Geocities proved to be a bad investment for Yahoo!. Having a Geocities page basically became synonymous with dilettantism and bad taste. Moreover, the days of home pages were numbered as people drifted to social network profiles. Ten years later, in April 2009, Yahoo! announced that it was shutting down Geocities. On 26 October 2009, Geocities ceased to exist. But during the time between the April announcement and its official death notice, a group of people calling themselves the Archive Team managed to rescue almost a terabyte of Geocities pages. On 26 October 2010, marking the first anniversary of this Digital Massacre, the Archive Team started to seed geocities.archiveteam.torrent. On 1 November 2010, my partner Dragan Espenschied and I bought a 2-TB disk and started downloading the largest bittorrent file of all time. In January 2011, we were able to start unzipping the first files to analyse them. The last bits reached us at the end of March 2011. In the meantime, we had fixed some file path errors and managed to release a modified version of the torrent. Geocities arrived in roughly 1995, and was, for hundreds of thousands of people, their first experience with the idea of a webpage, of a full-colour, completely controlled presentation on anything they wanted. For some people, their potential audience was greater for them than for anyone in the entire history of their genetic line. It was, to these people, breathtaking. 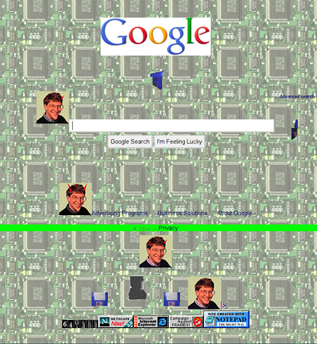 Geocities became the symbol of the amateur web – its locus in space and time – and for many, is still synonymous with the web as we came to know it. 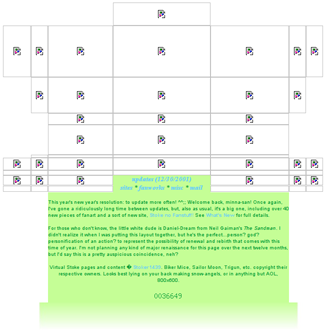 For instance, in 2004, the British designer Bruce Lawson made a provocative contribution to CSS Zen Garden with a page filled with animated graphics from various public domain collections. 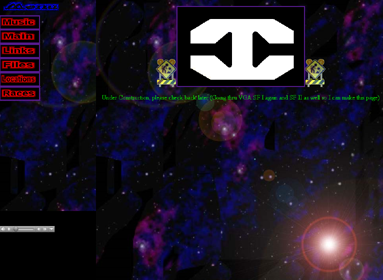 This theme was called “GeoCities 1996”. Another work that became well known recently was created by U.S. designer Mike Lacher. In 2010, he wrote a tool that would “make any webpage look like it was made by a 13 year-old in 1996!” and also included Geocities in the name – Geocities-izer. At the same time, we have to be careful – unforgiving, even – to refrain from reducing the wide variety of innovations creations by web amateurs to something you might see on some Geocities-user’s personal page. 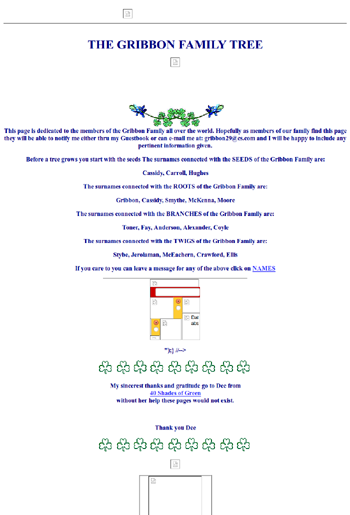 Geocities’ developments were special in many ways including the various templates and banners that Geocities imposed on its users, the linking system, the site’s own heroes and traditions that have never been really known beyond its own domain. 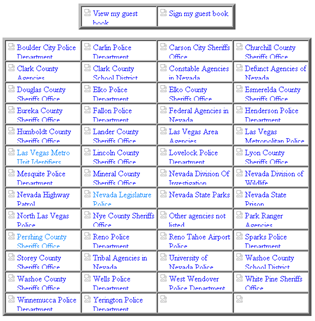 These included the graphics-related preferences of certain groups or, in Geocities lingo, “neighbourhoods.” And the very fact that the early Geocities was divided into themed neighbourhoods, such as “SoHo” for artists, “Heartland” for family and pets, “The Tropics” for vacations and travelling, the “Pentagon” for military personnel – structured user behaviour in a particular way. So it would be inappropriate to simply equate Geocities with the amateur web. Geocities was actually a universe of its own. We can see it very clearly now, ever since it was deleted from the web, and we can look through directory after directory, and immerse ourselves once again in a particular community or web ring. This artificial way of surfing helps to distinguish the Geocities-specific aesthetics and it eventually leads us to insights about what typical amateur elements originated on Geocities. Therein lies a curious paradox: On the one hand, the shutting down of Geocities was no doubt a barbaric act. On the other hand, all the buzz it created and the fact that Geocities was eventually rescued and archived has created this research opportunity to investigate the web as it existed in the 1990s in a more meaningful way than was ever possible before. This means looking at the sheer quantity of web profiles collected in one location, the freedom of not being dependent on search engine algorithms, the popularity of some of the page’s authors, their desire to link to other authors and the option to access data and run scripts that enable us to confirm or disprove our assumptions – or rather, memories – of the 90s web. For instance, by now we realise that Felix the Cat – one of the most widely used animated GIFs – was especially popular in Geocities’ Pentagon neighbourhood. We’ve also disproven my assumption, based on subjective experience, that the most common page section divider in the Pentagon neighbourhood was the blood dripping line, while it was actually an image of barbed wire. We’re looking for the origins of some navigation elements and are trying to determine which border set was the most popular among those in the Heartland community, and also how often users dared to alter the setmakers’ designs and combine elements from different graphics collections. A script written in May 2011 has, compiled a collection of more than 500,000 pages that use framesets, a technique which has justifiably been called unsuitable for any serious website and has been the subject of ridicule since mid-1996 – right from the moment of its inception. The material that we have amassed will help us to figure out exactly which types of framesets were the most popular, how correctly or incorrectly they were applied, to what extent users consciously misused this technique and how often and why users split their home page screens into three or more compartments. These are the questions that form the essence of research in the domain of Digital Folklore. The fact that a huge chunk of amateur web is available to researchers will certainly breathe new life into the field. Our intention in the near future is to write (and read) more than one paper on the subjects mentioned (and not yet mentioned) above. In the meantime, for the purposes of this essay, I would like to concentrate on some of the broader issues such as: How do web pages get old? What remains behind of dead web pages and web services? Strange as it may seem, the very first tag we entered when we started writing about our findings on the blog “One Terabyte of Kilobyte Age” was the word “alive”. And the very first post with this tag concerned a discovery that we thought was nothing less than sensational: www.geocities.com was still out there. Yahoo! had deleted the personal pages of all of its users, but the company’s clip art somehow survived online. You can see it for yourself by typing http://www.geocities.com/clipart/pbi/backgrounds/ into the address bar of your browser. This folder contains backgrounds, templates, navigation elements created not by users but by Yahoo!’s own designers to help users create their pages using Yahoo!’s proprietary software PageBuilder. These images presumably survived because, in October 2009, some Geocities users agreed to Yahoo!’s self-serving offer to move their pages to Yahoo! Web Hosting. This allowed the users to maintain the appearance and functionality of their sites, many of which had been created long ago with outdated versions of Yahoo!’s PageBuilder. It’s also possible that some of the old templates are still being used on Japan’s geocities.co.jp, which was never shut down. We could have checked this by asking Yahoo! !’s public relations department, but to be frank, I preferred not to do this because if my assumptions turned out to be wrong, it meant that http://www.geocities.com/clipart/ wasn’t supposed to have been left online. Maybe it was just a glitch that would eventually be repaired by their systems administrators. Which means files like BdayOrangeImage.gif, HobbyBlueBkgnd.gif, and MeetMyDogBkgnd.gif, among others, could be easily wiped off the net forever. These are the very files that do such a great job of documenting Yahoo! !’s ideas of how users should have designed their personal pages as well as what was considered a good home page choice at the end of the Millennium — and what was considered a good reason to put up a home page in the first place. This same folder contains an invisible but very important image – c.gif. Early web designers always kept a clear/empty image file containing just 1 pixel of nothing in their projects’ graphics folder. Sometimes they were “clear.gif”, while I called mine “0.gif”. 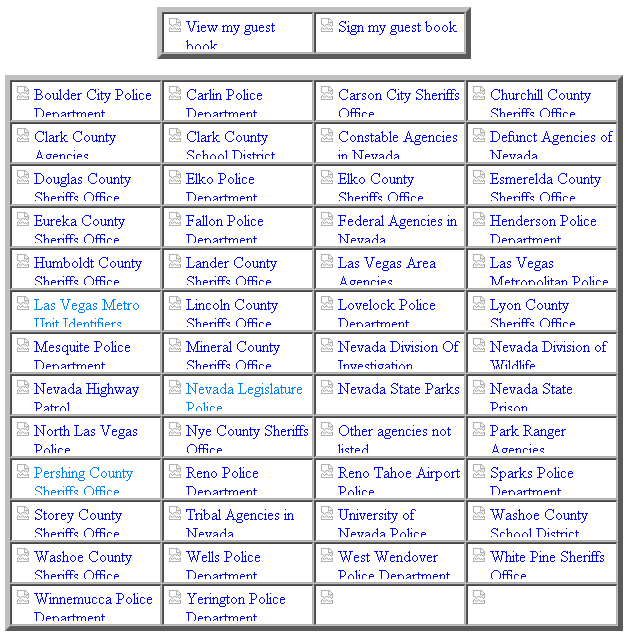 Geocities own file is 10×10 pixels. Clear GIFs were indispensible in the world of pre-CSS layouts. Invisible and small graphics could be stretched in width and height to keep the page’s visible elements at desirable distances from each other. Earlier this year, Dragan and I showed our c.gif findings at the Digital Folklore presentation at the New Museum in New York. Although most of the people in attendance were unable to see the importance of this miserable little invisible gif entity, there was one gentleman in the audience who assumed that the c.gif survives not because of the user profiles that Yahoo! continues to host, but because the entire Yahoo! empire would collapse without it. Maybe it is indeed still being used in the company’s own layouts and deleting it may very well be like pulling the critical wooden block out of the Jenga Tower. Good point! I can imagine an even more dramatic scenario, however. If Yahoo!! were to suddenly delete the c.gif, the shock waves of its action would be felt throughout the WWW. 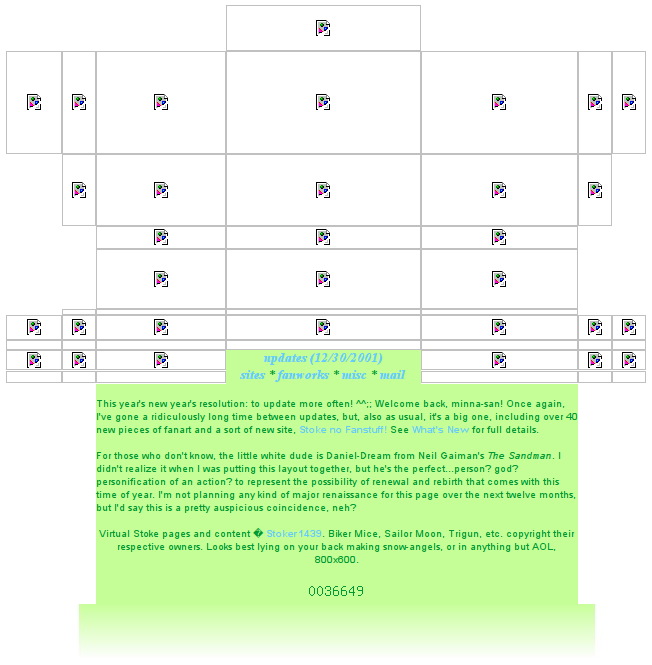 Because no one really knows how many layouts outside of the Geocities environment are based on this c.gif. This leads us to our next question: What have the ramifications of the deletion of Geocities been for the internet? How much? We’ll never know … But we know we got a bunch of Geocities sites – a significant percentage, especially of earlier, pre-acquisition data. We archived it as best we could, we compared notes, we merged and double-checked and did whatever needed to be done with what we happened to have. We often discovered that the links we were checking actually led to other files that had not been archived. Perhaps the Archive Team missed them, or perhaps, they had been deleted earlier. Partially preserved profiles, with some missing files, are also quite frequent. Missing images are, of course, especially common. A border with an icon inside it (different for every browser), telling the viewer that this is where an image was supposed to be, are a telltale, classic sign that the site is dead. Site designs based entirely on images were a common standard during the second half of the 90s, and in their abandonment, they became veritable ruins, spontaneous monuments to their designers. Once again, we don’t know whether the files were lost due to glitches during the archiving process, or to the site owner’s lack of skill or failure to maintain the files and links between them. Or maybe we should just blame the idea of distributed content itself. Sometimes we managed to find the pictures in a different folder and we were able to restore the page. If we didn’t find anything, we tried to imagine what it might have looked like judging from the file names and surviving page elements. And sometimes, we just looked at the remains, like tourists in ancient Pompeii. It’s hard to remain uninvolved for long, though. While you remain within the boundaries of the archive, the amount of destruction seems normal and even right to a certain extent: profiles that have been torn away from the web, never maintained, killed off, are not supposed to look any other way. But, by deleting Geocities off the net, Yahoo! has also contributed to the destruction of many pages on other servers and other services. Take the case of Tripod, for instance. 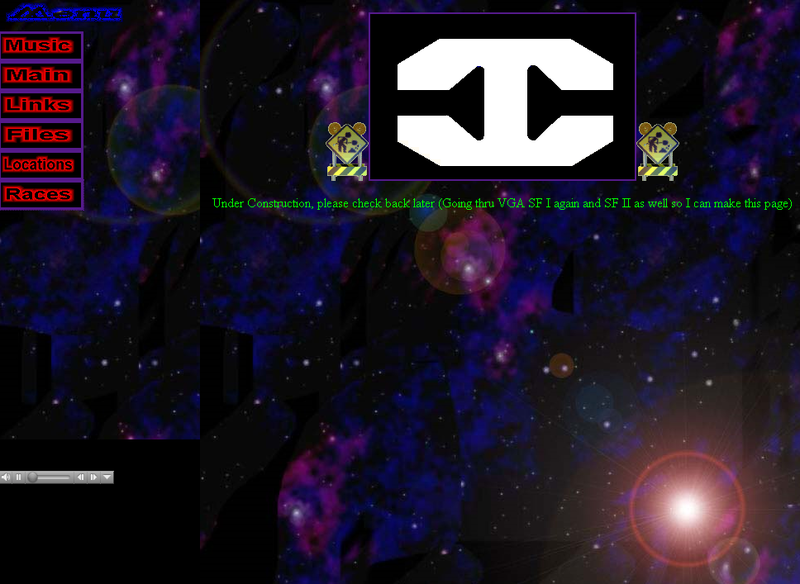 In the mid-90s, this contemporary and competitor of Geocities offered its users an advanced site-building engine, as well as graphics and rudimentary social networking tools. It enjoyed a fair amount of popularity, especially among college students, and was considered a more proper/tasteful place to maintain a profile. The onlybut very significant drawback was its size limit: Tripod users were limited to 100 KB of free space – while Geocities was already offering 1 MB. This is why some users turned to Geocities, while others maintained their sites on Tripod but used Geocities to store their larger jpegs, embedding them with absolute URLs into their Tripod pages. URLs that are no longer valid. This means that the scope of the destruction is much larger than originally assumed. There are many pages out there that look just like Dancing Jack’s account on Tripod.com or Clover Pony’s on Angelfire.com. Regular users may be unaware of it because it occurred on the peripheries of the web and concerned mainly old, unmaintained websites that never ranked very high on Google. Which doesn’t make it any less menacing. I think that the moment is ripe for the world to hear their sad story. These cases could serve as a model of a catastrophe that could easily happen if Flickr, YouTube or Picasa were suddenly to decide that our data isn’t valuable and profitable enough to continue to store. We created the tag “ruins” soon after we started working with the torrent, and realized that we would have to eventually deal with many malfunctioning pages and sites in one way or another. Missing images, dead links, placeholders for the Yahoo! Counter staring at you like empty eye sockets; and elsewhere, crazed calendars counting off the year 19111. We reserved the ruins section to publish the most striking or paradoxical screenshots. The more our eyes got used to all of the destruction, the more we were drawn to pages that were somehow completely preserved, sometimes perfectly, but still felt as if they were from a bygone era. First, we have the “Under Construction” pages – the ones that promise that new material will be published over the weekend or next week. Some include notes from the author pointing out that it’s been a long time since he or she has written anything (besides “Welcome to my Homepage”), and this is usually followed by promises to be more diligent in the future. Geocities is rife with these unfulfilled promises. 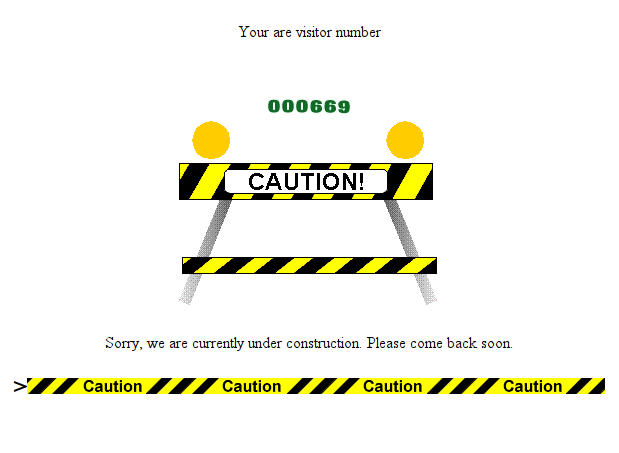 Some of them are nothing more than a line on an otherwise empty page, some are generously decorated with Under Construction graphics that are so characteristic of the late 90s. Any user could have any number of reasons for not returning to their projects. The main one being that most people didn’t really need home pages. Yet even those who didn’t really need a home page were trying their hand at being a webmaster. “I’ve no idea yet, on what to put here … BUT! … When you come back … I’m sure you’ll find something interesting!”, one user promises in 1997. His “coming soon” has remained online at http://www.geocities.com/Wellesley/1545/ for 13 years before it was archived for perpetuity. Unsuccessful attempts to set up a page have no particular value and may not be that visually gripping, but when you do come across them, you always get this special feeling – they remind you of the times when eternal construction was the core of all online activity. The other type of pages we call “This page has moved”. These include an author’s message declaring that his or her profile will no longer be updated. They may be neutral, sad, or sometimes full of hatred towards Geocities. The last type wasn’t so rare: At the turn of the century, users had plenty of reason to berate the service – including a lack of respect for the community and neighbourhood ideas, banners and watermarks that gave away the company’s intentions of catering to investors rather than users. While another variation on this were the happy and excited users who issued closing messages that announced they were finally buying their own domain name. These types of announcements speak volumes about the times in which they appeared – in the last months of the 20th century, the dot.com era, the times of commercialisation and individualisation of online worlds, of building walled gardens, both personal and corporate. These were the times when professional web design emerged and flourished, breeding contempt for Geocities-based design and its users who seemed to be “stuck” in the last century – namely, in communities and web rings. It is during this time that the name “Geocities” acquired most of its negative connotations and became a swear word in the professional community. But that’s not the reason why we categorised closed pages as ruins. Their goodbyes wouldn’t have seemed so dramatic if, when we clicked on the new address, a working website were to pop up. But that was never the case. Links led to 404 errors, domains that were for sale, or sold to someone else a long time ago. “My page has moved” announcements have outlived the new addresses. There’s a certain irony in that. Ten years is an extremely long time for a website – most of them don’t survive for that long, and those that do will most likely be the forgotten or closed profiles on free webhosting services. But not always. And here we come back to our “Alive” tag. It was not only the first tag we created – it happened to amass the most entries. Since it starts with an A, it’s the first one in the alphabetic list – a symbolic reference that’s very dear to us. The most exciting part of working with the archive hasn’t been the discovery of well-preserved relics but the fact that it turned out to be a great portal to the real web – pages that you can surf by clicking through the links (not by searching), where the author, the designer and the webmaster turn out to be one and the same person or relatives. Although it’s true that most of Geocities pages link to other Geocities pages; many of the links actually stay within a particular neighbourhood. But if you manage to get out of the Geocities archive through a link that is still pointing to a valid ressource, there is a good chance you’ll find yourself in a jungle of files and links that Google’s algorithms don’t even dare to wade through. For instance, many pages in the Heartland Neighbourhood used graphics made by Marsha, and there’s a button on them that leads to Marshasgraphics.com. This is how I found Marsha and from there I ended up on a page dedicated to her, where I found a link to “The Mystical world of Unicorns and Pegasus”. Here all of the unicorns looked familiar, but the theme music unicorn.mid made me curious. It appeared to be composed by Geoff, who has a rich collection of original MIDI compositions. Geoff’s wife writes about fairies, her garden and pets, and links to other users who share her passions. My trip could be endless. 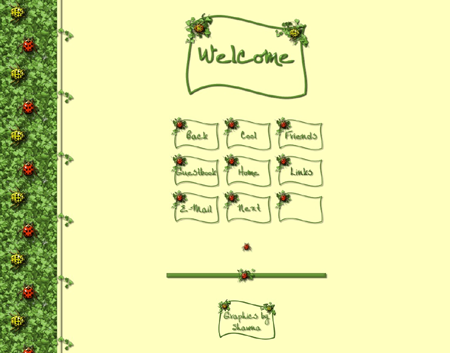 Another example is Narnie’s World, which contains links to dining establishments in Okeechobee, Florida, but also recipes, first aid tips, information for Vietnam veterans, Christmas pages, personal webcams. It was a personal link list that had grown into a valuable resource for the inhabitants of Okeechobee, Florida. Can we classify these not particularly modern and not very up-to-date pages as actually “alive”? Certainly. Even given the fact that Marshasgraphics was last updated in 2009, Unicorns and Pegasus in 2001. They comprise an alternative infrastructure; the web that they weave lies outside the walled gardens. The main question, however, is, for how long they will be able to continue doing that and remain more alive than the archived Geocities. Narnie’s World also led me to a magical tribute to the state of Michigan – “I am Michigan” – on the Richard’s Creations site, an ultimate fan site. Whatever or whomever Richard Nichols likes or admires becomes immortalised by him in HTML. His monuments, made of nested tables, background images and WAV sound files are funny, naive and touching. But, there’s more! “I am Michigan” is an proper resource offering useful links and information about Michigan. Earlier this year, Nichols wrote that he’d appreciate donations from the global web community to cover his web-hosting costs “otherwise the site will be taken down by July 2011”. Unfortunately, it happened. Richard’s Creations site is currently only accessible through the “Wayback Machine” of archive.org, and not even in its entirety. Regrettably, we were never able to create a mirror of the site while it was still up, and we continue to think that if only Richard Nichols had hosted his site on Geocities, it would have been closed a year and a half earlier, but at least more of it would have been saved. There are many pages in the archive that have remained intact since 1996. And whatever their appearance, they have something in common: pages made in the last century were designed for monitors of the last century. That’s why old jpegs aren’t just more compressed, they have smaller dimensions as well. Old GIFs don’t just contain less frames and refresh at crazy rates, but they also take up incredibly little screen space. We can often tell how old pages are not only by the date of the last update or the style and type of graphics used, but by their size as well. 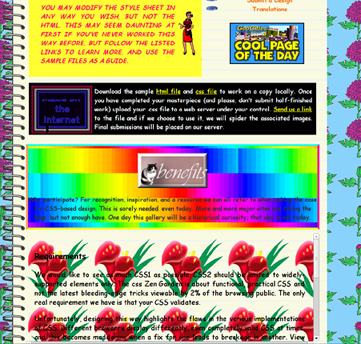 Many Geocities pages were decorated with bordered backgrounds. And it seems that they were designed specifically to betray age. 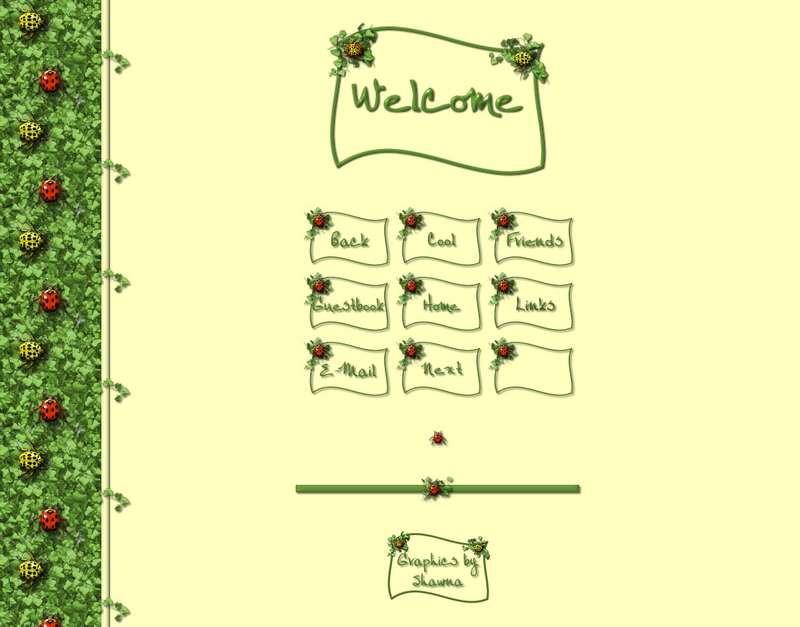 Pages with themed borders on the left were particularly popular among Geocities set makers –users who were courageous enough to offer selfmade sets of elements useful to create a typical personal page. 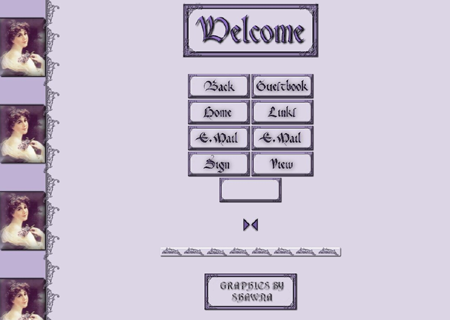 A set usually featured a background image and an image that declared “Welcome to My Home Page”, as well as buttons like “Back”, “Next”, “E-mail”, and elements to distinguish guestbooks and web rings. There were many great motifs to choose from in their collections, from neutral ones with generic ornaments to specific ones like Christmas, Halloween or a particular breed of dog. Religious and Victorian themes were admired by users, many of whom, contrary to the popular believe, were not teenagers or geeks, but professional housewives in their 50s. Bordered backgrounds were different from tiled backgrounds in that the last latter can repeat infinitely so the appearance of the background doesn’t depend on the size of the browser window or the user’s computer screen. Meanwhile, a bordered background, was not supposed to repeat horizontally. In other words, these were fairly short (to reduce traffic) but wide background images that could fill up an entire screen: 640, 800, or 1024 pixels, depending on the year they were created. Other common backgrounds were comprised of 700 or 1000 pixels in width. These backgrounds were particularly charming because adding this little extra breadth meant that the authors were preparing for the future – the very future that I am now observing them from. Needless to say that on my screen – which is far from the biggest available today – I see these borders repeating two, sometimes three times, and, in the same way that we can count the concentric rings of a tree stump to estimate the age of a tree, the number of repetitions on some level give an indication of the page’s age and how much the author was able to envision the speed at which technology progresses. 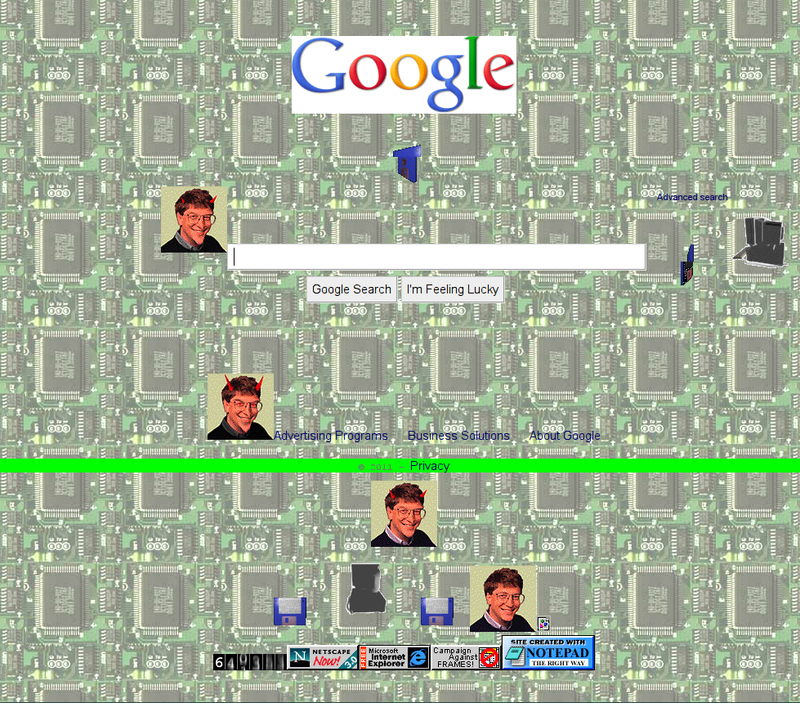 We know how the web looked in the 90s. An exaggerated version of this aesthetic spilled over into modern design in the form of starry wallpapers, “under construction” signs, and animated GIFs. Whenever a designer or artist wants to recreate that 90s feel, they usually turn to these elements, which is acknowledged by those who remember or studied web design seriously. Various research and/or art projects allow us the opportunity to catch a glimpse of the past. But this is not the same as actually revealing or feeling the age of this particular medium. The web is almost 20 years old now. Throughout these years, it has transformed from a new medium to new media in the best very sense of the word – it continues to evolve. Its “stupidity”, its neutrality, which lies at the core of internet architecture, allows it to continue to grow but without ever really growing old or mature. Dealing with an eternally young medium means that we always have to deal with something new – technically as well as ideologically and aesthetically. It means that the dying of web pages, users or services is seen as a natural process. And it makes no sense to speak of a project reaching middle age, because age has no value here. Getting old is something that you don’t do on the net. 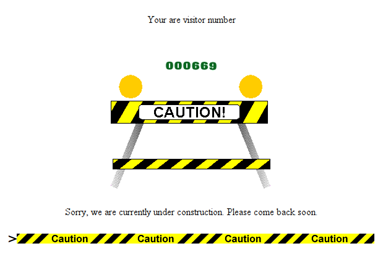 The Geocities archive provides us with the experience of getting old. Coming into contact with aged pages is an important lesson that defies the impression that on the net, everything always happens in the present.